Eucalyptus has been used since ancient times for its respiratory benefits and its pleasing scent. This highly-adaptable Australian native hides plenty more value. Eucalyptus, an evergreen originally from Australia, has been a popular herb in drinks and food alike for hundreds of years. Many people know it's the favorite food of koalas, but remain unaware of its immense nutritional and medicinal value. The aboriginal uses of eucalyptus have spread from Australia across the world, and in fact, the scent of eucalyptus oil is associated with treatment of colds for many people. Treating infections. Aboriginal people of Australia have classically used eucalyptus as a remedy for fevers, wound healing, and infections in general, especially respiratory and oral infections. Due to its high antiseptic properties, eucalyptus is still used for treating infections, such as bronchitis. Relieving congestion. Perhaps one of its most well-known medicinal properties, the Aboriginals were the first to use this herb as a decongestive. 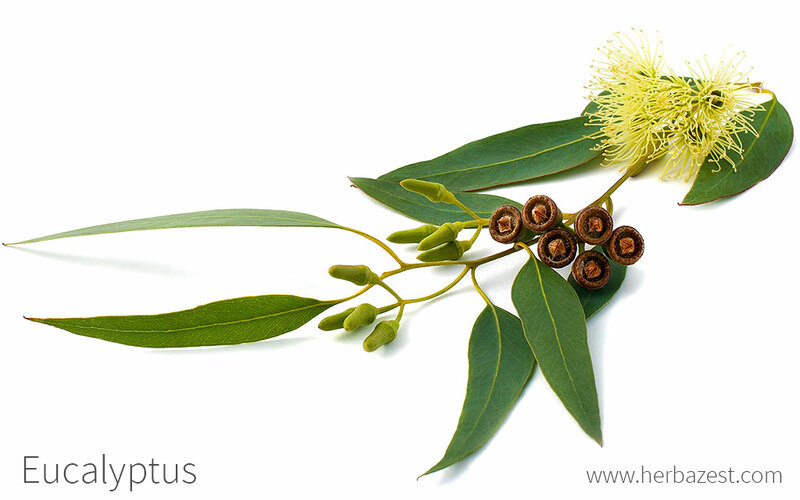 Eucalyptus is also used for treating sinuses and reducing hay fever symptoms. Pain relief. Because of its anti-inflammatory properties, eucalyptus oil preparations are sometimes rubbed on sore joints to relieve pain. Reducing blood sugar levels. Eucalyptus has been used to the past to lower blood sugar, although not much is known about how to apply this or how well it works. Eucalyptus essential oil is about 80% eucalyptol, a highly antiseptic compound. This herb is also an expectorant, breaking up phlegm and helping clear the airways. The leaves of this plant also contain tannins, a common plant compound that may diminish inflammation. While research into eucalyptus's precise mechanism of action is lacking, it is likely that the combination of its varied phytonutrients provide the plant's medicinal action. EUCALYPTOL, ALSO REFERRED TO AS CINEOLE, IS A TERPENE THAT CAN INHIBIT SOME BACTERIA AND FUNGI. Other herbs with antiseptic properties are calendula and thyme, while chili pepper and myrtle also have decongestant properties. Eucalyptus leaves are likely safe when consumed in controlled quantities. It is possible to get eucalyptus poisoning with overuse of essential oils. Signs of eucalyptus poisoning include upset stomach, dizziness, muscle weakness, difficulty breathing, nausea, vomiting, and diarrhea. While controlled dosages of eucalyptus are generally safe for adults and older children, it is likely unsafe for children under the age of six. However, essential oil should be taken with caution because high doses can be toxic or fatal, regardless of age. Because eucalyptus can affect blood sugar levels, those who will soon be undergoing surgery or those who suffer from diabetes should avoid eucalyptus. The use of eucalyptus essential oil is not recommended for women who are pregnant or breastfeeding. The most effective way of obtaining the health benefits from eucalyptus is in medicinal forms of consumption. Steam. When fresh or dried eucalyptus leaves are covered with boiling water in a large bowl and inhaled as a vapor, they are highly effective in treating congestion, breaking up phlegm and clearing up passageways. Eucalyptus vapor can reduce the severity of airborne allergies and relieve sore throats. Infusion. In spite of being sluightly bitter, eucalyptus leaves can be stepped in water to make a warm infusion, which can sooth a sore throat and reduce coughing. Essential oil. Whether inhaled or applied after it has been properly diluted, eucalyptus essential oil can reduce sinus pain and swelling, as well as nasal congestion. It also can help reduce joint pain. Tincture. Like essential oil, eucalyptus tinctures can be inhaled or applied topically. Eucalyptus tinctures are typically used for decongestion due to its expectorant properties. Ointment. As a cream, eucalyptus can be applied topically to relieve inflammation from joint pain and insect bites. Capsules. When taken in this form, eucalyptus acts as a highly potent decongestive, helping to ease coughs and relieve sore throats. Eucalyptus grows naturally in tempered areas, where it can usually be seen in large groups pf trees. However, the dried leaves are usually available in herbal shops and specialized health stores, as well as in online retailers. Eucalyptus is most easily found at most pharmacies and supermarkets as premade over-the-counter preparations, like capsules and tablets, mouthwashes, and vapor rub. Eucalyptus essential oil is available at specialized health stores, supermarkets, and online retailers, sometimes mixed with other essential oils. THE U.S. AND U.K. REQUIRE COMMERCIALLY-SOLD EUCALYPTUS ESSENTIAL OIL TO CONTAIN AT LEAST 70% EUCALYPTOL. Because the allelopathic process, eucalyptus secretes chemicals that inhibit the growth of nearby plants. It is therefore not advisable to grow other species alongside eucalyptus trees or in soil where these trees had recently been growing. Eucalyptus trees require soil with a good drainage system, large clay content, slightly acidic to slightly alkaline pH. Full sun exposure is required in order for them to grow. Seeds should be stratified before planting. Seedlings will not tolerate temperatures lower than 10° C (50° F) for long periods, so eucalyptus trees should be grow indoors before outdoor planting if it is a cold climate. Eucalyptus trees should be watered immediately before and after planting. The tree grows best in hardiness zones 8 - 10. The eucalyptus is an evergreen tree that can reach heights of 180 feet (55 m) and its trunk is made of dense wood. Its leaves, about 2.4 - 6 inches (6 - 15 cm) long, are covered with a bluish gray wax, giving the tree its common name, "blue gum." Eucalyptus is a member of the Myrtaceae family, which contains over 5,650 species spread out over 150 genera. All of the members of this family, such as myrtle (Myrtus communis), guava (Psidium guajava), and camu camu (Myrciaria dubia) are woody plants that contain essential oils. Eucalyptus globulus is divided into four subspecies: E. globulus subsp. bicostata, E. globulus subsp. globulus, E. globulus subsp. maidenii, and E. globulus subsp. pseudoglobulus. However, some taxonomists - including the official stance of the Royal Botanical Gardens in Sydney (Australia) consider these four to be separate species. Australian aboriginals were the first people to recognize the medicinal qualities of eucalyptus, and they named it kino. Eucalyptus oil reached Europe and the greater West during the 19th century, and it was later developed into a commonly-used antiseptic during surgical procedures. Eucalyptus's main economic importance is in the timber and essential oil industries. In Australia, 65% of the whole hardwood plantation corresponds to timber. The leaves of the eucalyptus are used for the production of essential oils, which are then used in perfumes, repellents, and therapeutic treatments. Nowadays, China is the biggest producer of eucalyptus oil, providing approximately 70% of the world's supply. In addition, fresh leaves are used in many zoos throughout the world to feed koalas. A single zoo in the U.S. can use over $10,000 USD a year in fresh leaves. The scent of eucalyptus was believed to purify the air where the tree grows, and the gum that falls from the branches was thought to purify the ground. It was later discovered that this "purification" was actually a decrease in malaria vectors thanks to eucalyptus's ability to dry up swamp lands. Though a less common practice nowadays, eucalyptus leaves are sometimes hung in households as a "purifier" and natural air freshener. For wood. Several members of the Eucalyptus genus are very tall and fast-growing trees that produce a hard wood good for timber. This can later be processed into paper, ships, railroad ties, mulch, charcoal, or biofuel. The wood of eucalyptus is used to make an aboriginal musical instrument called the didgeridoo. For oral care. Eucalyptus is added to many mouthwashes and toothpastes. The oil is also an ingredient in some dentistry products used to seal root canals and fillings. For environmental purposes. Because eucalyptus trees absorb large amounts of water, they can be used to dry up swampy areas and desalinate the soil. While this can have repercussions in some areas if not implemented with care, it can be successfully used to reduce the risk of malaria. Eucalyptus can also be used to prevent soil erosion thanks to its strong root system. For gold prospecting. Micro-deposits of gold have been found in the leaves of eucalyptus. Since these deposits were absorbed from the surrounding soil, scanning eucalyptus leaves for gold is an environmentally-friendly way to detect gold deposits in the area that could be exploited. For farming. Eucalyptus is a good tree to form windbreaks to protect people, homes, crops, livestock, and habitats thanks to its thick foliage and solid root system. It can also serve as forest cover for woodland crops. In addition, dried leaves can be used as feed for cattle, horses, and sheep. For cosmetics. Eucalyptus is used in many beauty products, thanks in part to its pleasing scent. It can be found in some lotions, bubble bath solutions, shower steamers, salts, soaps, salves, scrubs, deodorants, and more. For repelling insects. Insect repellents containing eucalyptus are also available.